I want to keep this simple, as best I can explain, about 5-8 years ago it became trendy for people under 40 to use backpacks for travel luggage. From 1965 until maybe 2005 it was Europeans would travel for 6 months to two years internationally. American would do maybe 1-2 months in Europe, and then think about other places continents. Roughly, in 2005 it became trendy for all people under 40 to buy a backpack to use a luggage, this confused the backpacker culture it started changing. The average time out for a backpacker dropped from about eight months to 30 days from 2005 until now 2013. People that travel with a backpack for less than 30 days are called Flashpackers, I do not really care to understand why, but to me, they are flashy, quick, and tourist disguised as backpackers. They are trendy, yuppie; there it is more of a fashion statement, and not the budget traveler bunch, tourist with backpacks as luggage. Backpackers are fading away, because it is not easy to notice a person out for a year, when surrounded by other people with backpacks out for 30 days. And, the “Flashy” backpacker has no pride in budgets, going cheap and is insulting, and denigrates the true budget traveler. 15 years ago, wise use of 12-15,000 dollars could make a one year trip into three years; this type of thinking has been lost. 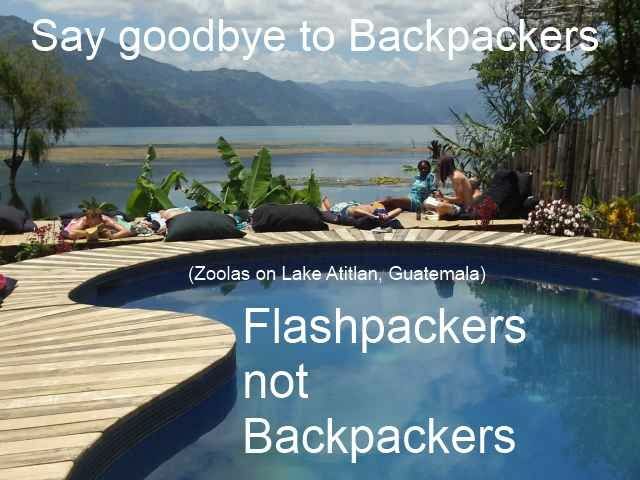 Generally, this new Flashpacker has become the standard Backpacker, while Backpackers 15 years ago had great pride, took 12,000-15,000 dollars an went on 1-2 year trips, walked, sacrificed and would talk at length on how they saved money. This thrifty Backpacker is not confronted by a Flashpacker that spends 4-5,000 dollars in 30 day, and is proud when the live in a Five Star, recommended on TripAdvisor, resort. These people are painful to be near, they are on vacation, and money is not important, they are going home in 30 days. Trust me; the biggest insult on the planet it to call someone cheap, the backpackers are in hiding, pretending to be part of the gang. 2013, the end of the Lonely Planet Backpacker, the end of Frommer Europe on 5 and 10 dollars per day, BBC purchased Lonely Planet, Frommer went Europe 20 year ago, the travel industry is losing a way for the average person to see the world on a budget. Let me introduce you to the people on the splurge, living same economic backpacker model as the United States Economy. Borrow it, pay it back later, and never sacrifice the good life. Oh yes, the Africa Overlanders make the Flashpackers look cheap! I never got caught in the backpacker culture as I had to work for the man for a living. But I did make my 1st trip to Europe with a wife and backpacks. We stayed in the Frommer $5 hotels for 9 weeks. I now still at a much older age go with a backpack/flashpack when I travel because it accomplishes two things, it forces you to pack a lot lighter and not take things you really don't need and it is more convenient and easier to carry than 2 or 3 suitcases regardless of the wheels that half the time get broken. I look back and I wish I would have been able to spent 2/3 years on 10/15K back in the 60s/70s traveling but we could not all do that for various reasons. But I now travel with comfort, never have and never will do "If It's Tuesday, This Must Be Belgium" bit, I stay in places and enjoy for a time then move on, with my backpack. The travel culture has definitely changed. No doubt about that. But the serious travelers still get a lot of bang for their buck. I really see no point in spending lot of time and money to get to a destination and then staying two or three days. It takes that long just to find a decent coffee shop. I tend to gravitate back to the places I really liked. Lago Atitlan, Subic Bay, and hopefully Costa Rica in the not too distant future. I have a kind of custom baggage set up with a soft carry on that sits on top of my roll away bag. It stays in place thanks to some well placed Velcro. I tend to travel kind of light though. My roll away is just a tiny bit bigger than the carry on roll away. I have definitely learned a lot about the dos and don'ts of air travel though. There is kind of knack for doing it the easiest and most pleasant way. I started watching the cabin staff and taking notes and learning where the best seats are and which airlines to avoid. And which air craft to avoid. And which airports to avoid at all cost. LOL. But I may be a little biased towards air travel. I flew air crew in the navy and as a civilian. So needless to say, I love flying. And I sleep like a log once the lights are turned down. Here are some tips for air travel. Take your own favorite condiments. And take one of those little salt and pepper shakers. I love salt and pepper. And take along a couple nice cup cakes or fruit pies for snacks. And I travel with little packets of my favorite instant coffee. And I take along a couple dinner rolls and some little packets of jam and little packets of real butter. Needless to say this really adds to the flavor of airline food. And another tip. Asian airlines like Eva Air, JAL, and PAL really take good care of you. The stewardesses on Japan Airlines constantly bow and just bend over backwards to take care of the passengers.